The knee problem that forced off Cristiano Ronaldo during Real Madrid's Champions League tie against Borussia Dortmund is not serious, says coach Carlo Ancelotti. The 29-year-old forward was substituted in the 80th minute, having scored one of the three goals in Real's 3-0 quarter-final first-leg win. 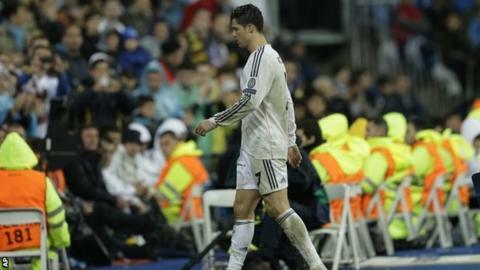 "Ronaldo had a knee problem but I took him off to avoid any risks," said Real coach Carlo Ancelotti. "It's just a minor annoyance." Spanish newspapers reported last week that the Portugal international had been suffering from a niggle in his left knee since the 3-1 Champions League win at home to Schalke on 18 March. Ronaldo scored his 49th Champions League goal for Real in the 57th minute after first-half goals from Gareth Bale and Isco had given the Spanish giants a 2-0 lead at the break. "I'm very pleased with the result and the attitude of the team," added the Italian coach. "It wasn't going to be an easy game, but we started well. We slowed the game down but even then, Dortmund is a very dangerous team on the counter-attack, though our defence coped with everything." Jurgen Klopp's Dortmund, who were beaten by Bayern Munich in last season's final, also had their chances, going close through Pierre-Emerick Aubameyang and Henrikh Mkhitaryan. However, it was a night when Real keeper Iker Casillas was rarely called into action. "We practically assisted two of their goals ourselves," said Klopp. "We made it too easy for them for their second and third goal. We left too much room and weren't as compact as I would've liked. But we also have to understand that we played against one of the best teams in the world today."